A pastel drawing by Richard Flores. 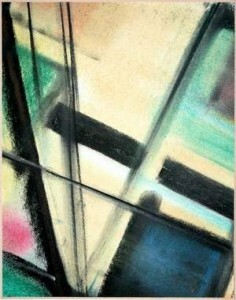 Artist Richard Flores ’76 (Art), M.A. ’86 (Art Three Dimensional) has worked with some of the best artists in the world, including the late Beatrice Wood and Richard Marquis. The College of the Sequoias, where Flores teaches, his hosting an exhibition of his work, “The Urban Sketch Experiment,” which runs through Sept. 20. “My work concerns challenging the basic and passionate connection I feel with the world and everyone in it while adventurously exploring the infinite possibilities of form, color and texture creatively expressed through art,” Flores told the Visalia Times-Delta. He has exhibited nationally in ceramics, sculpture and glass and is a former recipient of the Richard Deher Memorial Scholarship from California State University, Northridge. He was also a juried member of the Ojai Studio Artists and an invited visiting artist at many universities, including Harvard.